Teamwork, professionalism, promptness, and accuracy were the hallmarks for managing the Maryland State Highway Administration’s (SHA) interchange project at MD 32 and Burntwoods Road. 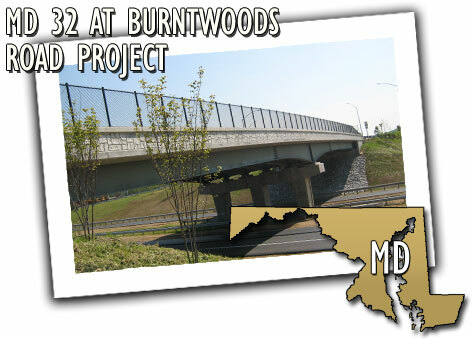 The MD 32 Corridor is a commuter route that carries traffic from I-97 near Annapolis, through Howard County, to Carroll County, MD. Between MD 108 and I-70 lies a rural two-lane section of MD 32 that now sees an average of 30,000 vehicles a day. Despite numerous safety benefits that have been implemented, high speeds and heavy traffic prompted more drastic and effective changes. At $18.5 million in construction costs, this complex interchange included reconstruction of MD 32 from an undivided two-lane section to a divided section with accommodations for the controlled access freeway planned in the future. A design team, composed of consultants and staff representing SHA, Howard County, and Federal Highway Administration (FHWA), developed the plans and used a variety of venues to inform the public, provide mobility, and create a safe work zone for everyone. A direct telephone number to the project engineer was also distributed so people could call with any questions or concerns and get an informed response.